I wonder if Nature is more compassionate than we give her credit for. Last Sunday afternoon, I was fiddling around in the flower bed in front of my house when I saw yet another anole. We have had a bunch of these little chameleon-like creatures in our yard this summer; I think the wet weather has led to an abundance of greenery, which has led to an abundance of insects, which supports a larger population of predators who eat primarily insects, including anoles. I have seen many anoles in the past few weeks which were quite small, as if there was a baby boom among the reptilian crowd in my yard. I don’t mind; did I mention that they eat bugs? And they’re kind of cute and fascinating and quite photogenic. I went inside to get my camera. I have taken plenty of photos of the anoles in my yard, but the light was nice, and I had a few minutes, and this one looked especially striking against the large, smooth texture of the leaves of the elephant ears. I chose the long lens, thinking that I would get a better close-up with the greater zoom. Once I got my equipment together, I stood the requisite three feet away to get the zoom lens and auto focus to work right together. I looked through the viewfinder, and started snapping photos. Then, I noticed something that made this particular anole unique. At first, I didn’t believe it. I had to do a double-take, and then look at the screen on my camera to see if it was real. Maybe I was just looking from a funny angle; maybe it was hidden behind a leaf or an arm or something. But no; it was just the way I saw it. The anole was missing a hand. He was, well, how would he like to be called? Was he handicapped? Or did he prefer disabled? That didn’t make any sense. Clearly, this animal was quite well-abled. Before I knew he was, um, different, I had watched him easily climb up the long stem of the elephant ear leaf. He was not especially thin, which would have indicated that he could not keep up with the bugs which make up his diet. He looked more mature than many of the smaller anoles I have seen in my yard recently, which means he could run deftly enough to get away from whatever considers him prey. He was just as able as any anole I have seen. So what was he? Was he “differently-abled?” No; that sounds a little condescending. How would I describe him? He was simply missing a hand. What I really wanted to do was to ask him some questions. How did he lose his hand? Was it a dramatic escape from one of the neighborhood cats? Did he cross into some other anole’s territory and get into a fight? Did he get trapped between a rock and a hard place and have to choose between his hand and his life? Or was he just born that way, with some sort of genetic mix-up which missed the cue to grow what would otherwise be at the end of his arm while he was inside his egg? I was too shy to ask him those questions, though. I realized I really don’t know him at all, so it seemed somehow impolite to get so personal. I hated the fact that I was staring at him for so long. I didn’t want him to feel awkward. But still, I was fascinated: how did he walk? 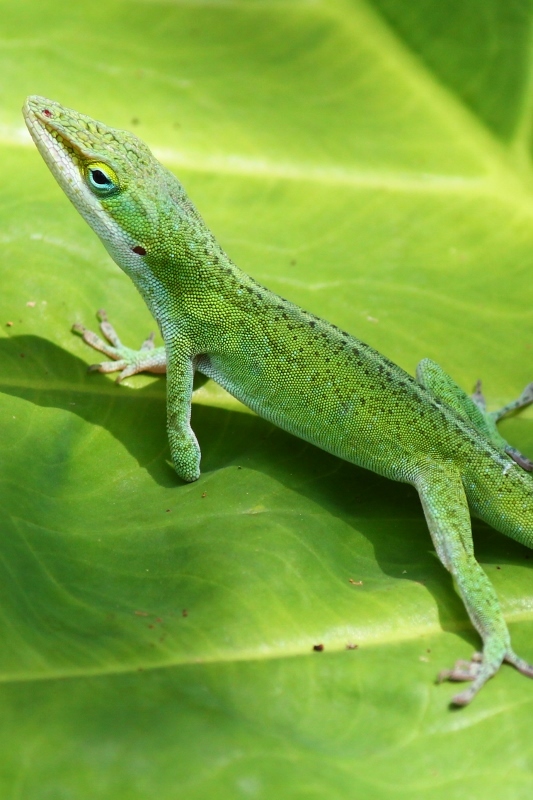 Was it different than the way other anoles walk? Could he lunge so he could take his prey by surprise? Or did he have to learn a different way to hunt after his accident, or his fight, or whatever it was that caused him to lose his hand. He seemed willing to have me take his portrait, so I thought to myself that it would be more polite to just look at the pictures later rather than to keep gawking and wondering in the moment. Soon enough, he spotted something that had landed a few inches in front of him on the leaf, and we both moved on. As I think about my encounter with this anole, however, I realized I am surprised at the grace of Nature this anole reveals. I think of Nature as a harsh, rational, survival-of-the-fittest kind of power. The Darwinians teach us that, right? Only the strong, healthy, and fully able survive in Nature. Those who are weak in body, mind, or spirit are picked off by predators or simply left to starve and die alone. The struggle to survive is the only way each species remains strong enough to carry good genetic material on to future generations. It seems cruel to us as sophisticated, self-reflective creatures, but that is just how Nature works. But here was an animal who had faced some kind of trauma, either in his formation or in a fight, and that trauma hadn’t killed him. His body healed itself: his blood clotted to keep him from losing what little liquid life force he has inside him, his antibodies prevented infection without the help of Neosporin, his skin closed over the place where his hand used to be with no stitches or Band-Aids, the muscles in his shoulder and elbow and leg strengthened to compensate for the balance and coordination he would otherwise have from his hand. His mind taught him how to adapt. His surroundings nurtured him until he could get the food and the shelter he needed all on his own. Anoles are notoriously lonely beings, aggressively territorial and unlikely to socialize with other anoles, even their own young, for any purpose other than to mate. So I don’t assume that he had the care of a mother or a father or a kind neighbor or supportive teacher to help him figure out how he was going to get along without his hand. I doubt his insurance covered occupational therapy. Still, Nature didn’t dispose of him like a strictly rational Darwinian would suppose. Nature nurtured him so he could get along just fine, hand or no hand, fulfilling his function of keeping the population of insects in check in his little territory in the flower bed in front of my house. And Nature doesn’t feel the need to put a label on this particular anole. Nature doesn’t ask nosy questions about how he came to be so, well, abnormal. Nature doesn’t gawk or stare at the injury or single him out in any way at all. Nature just lets him go about his business. Note: I now have note cards with images of Anoles available for sale in my online shop, so you can share these fascinating creatures with your friends and family! Click here to check them out! 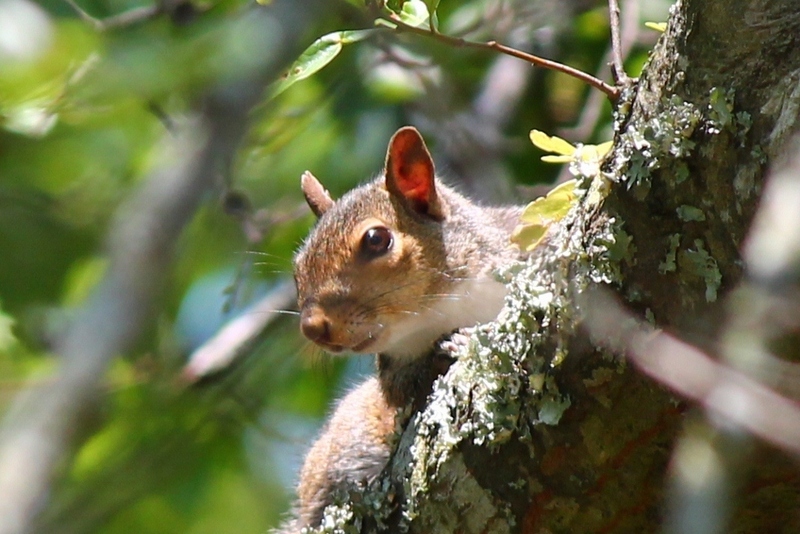 We have plenty of squirrels around here. Lately, the darn things have been eating all of the food out of the bird feeders. Of course, squirrels on the bird feeders is nothing new to anyone who has ever kept a bird feeder in an average neighborhood like ours. But the piggish little fiends don’t know when to stop. It would be one thing if they just came for a little snack now and then. Maybe they could pick up some of the little seeds off the ground that the cardinals and blue jays and other birds don’t like so much. But that is not what the rascals do. Instead, they crawl up the poles the bird feeders hang from, they jump on the feeders, they knock seed hither and yon, they do all sorts of contortions to fit in a space that was not designed for them, and they camp out there for hours, happily munching away as if the rest of the world owes them the courtesy of leaving them alone while they drive away the prettier creatures. You can see I have feelings about the squirrels. They really are just rats with fluffy tails and better PR. In our house, we have found a new favorite way to deal with the problem. Our chocolate lab, the story goes, once had to live in the wilds of rural Georgia and hunt for his own food before he was rescued and became a part of our family. When we got him, a woman who has more money to spend on animals than we do had hired a trainer to teach him basic commands. Uncle Skip, as our trainer is affectionately known in our house, loves our dog, and he told us that a dog like him needs to have short bursts of intense activity to really stay in shape. So it doesn’t take an engineer to put it all together. The squirrels camp out on the bird feeders. The squirrels annoy me. The dog knows how to hunt. The dog needs bursts of activity. All we have to do is get him excited, quietly open the back door, and in a flurry of dog energy and squirrel fright, the dog chases the squirrels up the nearest tree and returns, gleefully accepting our praise. And then, because the squirrels don’t seem to be the brightest bulbs in the backyard chandelier, they come back, and our faithful canine gets to put every fiber of his being into action as he rushes out hunting another time. A couple of weeks ago, though, I decided to take my camera into the back yard to practice taking wildlife shots. I know, I know; the purple finches and house sparrows which frequent our back yard can hardly be considered good subjects for wildlife shots. I would rather be photographing grizzly bears catching fish in their jaws in the misty spray of mountain rivers, but some book I read said that taking photos in the back yard is good practice. So I was watching the trees, and I found a couple of squirrels running around. I took some pictures of them, including the one you see above. As I was looking at the photo later, I realized what I had done. I took a portrait of this animal. The photo let me look in his eyes, and see the shape of his face and the line of his jaw. I could see how he was holding his mouth closed, and the brightness of his ears as he held them alert, and his relaxed brow which let his eyes enjoy the view from up in the tree. An expression almost emerged. And we know from looking at really good portraits of people that behind the expression on the subject’s face is a story. I started to imagine this squirrel’s story: what he was planning to do in the tree that day, what he had been through to get to that tree, where he had eaten his breakfast, what his friend in the next tree had told him just a few minutes before. It gets a little ridiculous, but you can look at him and wonder what his family life is like, whether he might really be older than he looks, what good and bad choices he had made in the past which led him to that moment in that tree in my back yard. These are the reasons why, despite my interest in photography as a way to preserve and share beauty, I am not comfortable taking many close-up photos of people outside my immediate family. There is a deep intimacy to good close-up portraits. In a good close-up, you can see the creases in a person’s face, and the shape of their brow, and the glistening depths of their eyes. Their expression tells something about their story, and if you look at the portrait closely, you start to feel like you might even be reading details of their story they have never spoken to anyone. I have several photography books which give good advice on how to create portraits like that: how to angle the lighting, how to set up the camera, how to frame the shot, and how to zoom and crop so that there are no distracting details but only the person’s expression. I think photos like that are beautiful in a way that I’m not sure I can express in words. But every time I try to take a photo like that, I jump back in fright. There is too much intimacy in the act of taking a photo like that. Maybe for now I can stick with “wildlife” photos like the one above. They might be just what I need. If I am not careful with them, they might even teach me sympathy, or even empathy, for the fiendish squirrels who thwart my ideas of what kinds of creatures are worthy to be called beautiful.